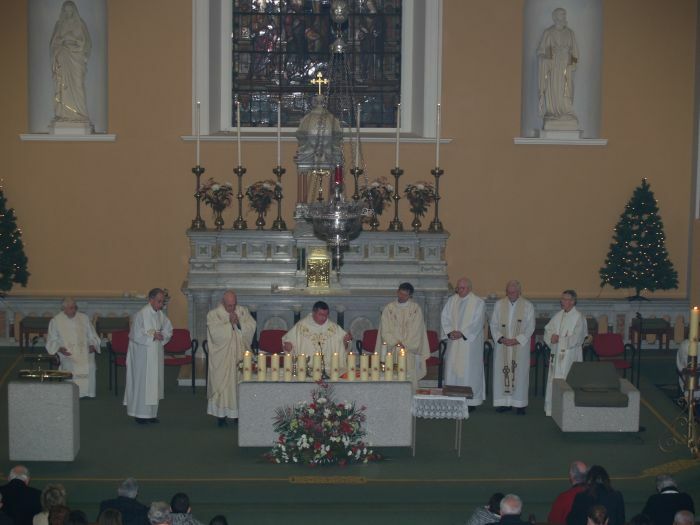 Celebrations for the 150 years of the Churches dedication got off to a flying start on January 2nd with a special mass at 12 noon. Guest of Honour to perform the official opening was Mr Ronnie Delaney, Arklow born Olympic Gold Medal Winner . Fr. 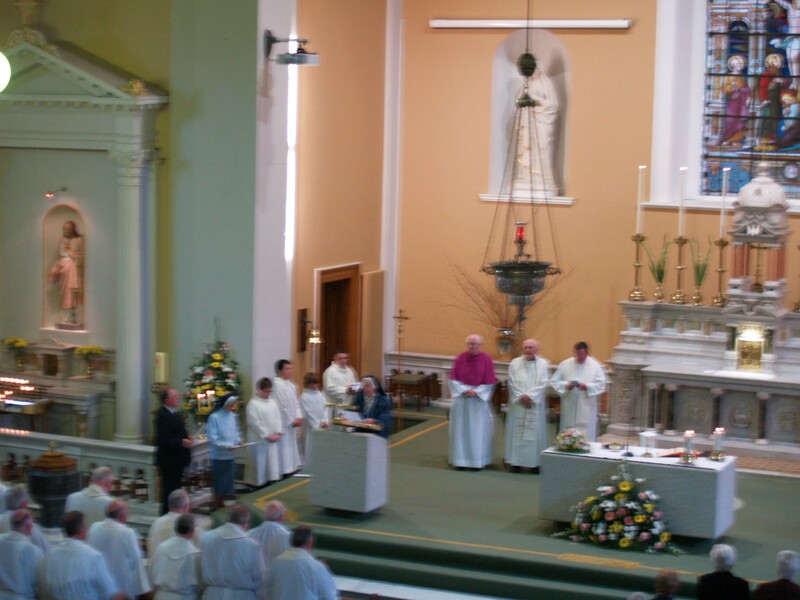 Martin Cosgrove PP, celebrated the mass, assisted by Fr. 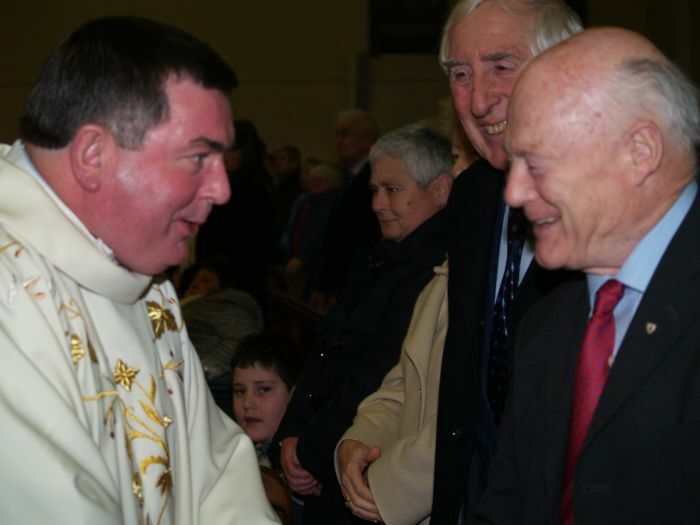 Michael Murtagh, Monsignor Colm Gallagher, John Canon Piert, Fr. Dan Breen, Fr. 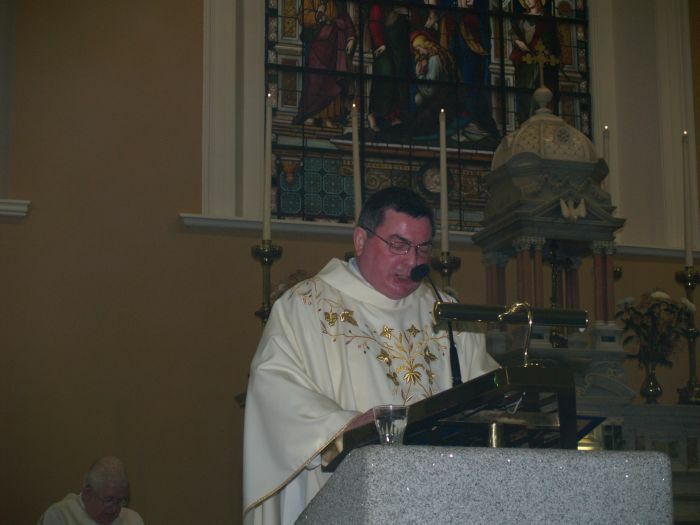 Kevin Lawlor, Fr. Liam Dunne, and Fr. Sean O’Toole. Also present were Rev. Nigel Sherwood, Church of Ireland and Rev. Michael Anderson, Presbyterian Church. A procession of parish groups carried 15 jubilee candles to the altar, each candle representing one decade of the Church. 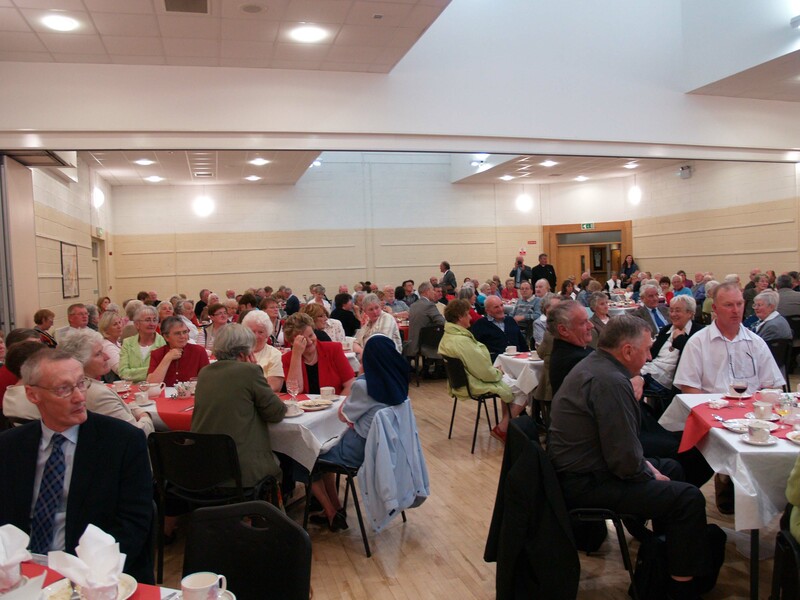 Chairperson of 150 committee Mr. Jimmy Dunne gave the opening address and welcomed everybody to the celebrations to pay tribute to our forefathers, who built our beautiful Church and he acknowledged that our celebrations and contributions are the history we will leave for future generations. Fr. Martin Cosgrove PP gave the homily, where he encouraged the community to enthusiastically engage with the years events, and acknowledged that our Church will always be a place of prayer and worship. 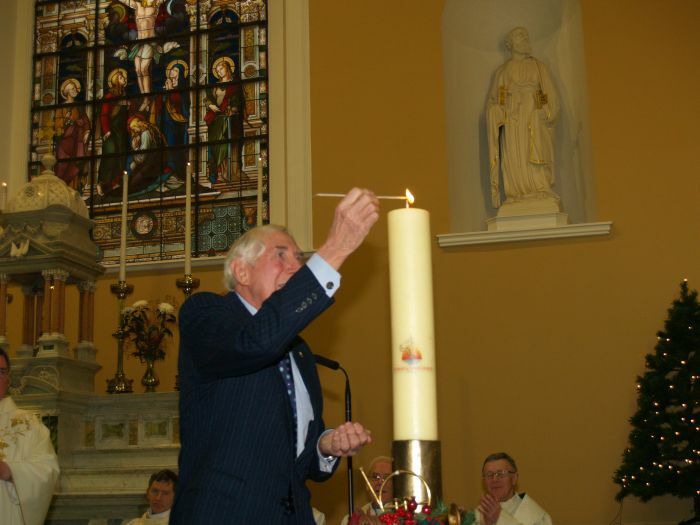 Official launch took place by our Guest of Honour Mr. Ronnie Delaney, who gave a short speech and then proceeded to light the Jubilee Candle which was accompanied by a cornet salute by two members of the Silver Band. 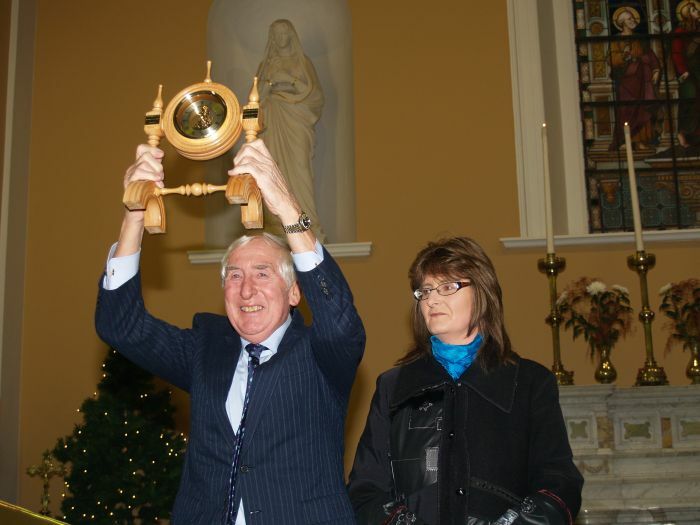 Chairperson of the Parish Pastoral Council, Hilary Sharpe, made a Presentation of a clock set in locally timber to Mr. Ronnie Delaney. John and Katherine Kinsella provided Gathering Music. Arklow Male Voice Choir, under the direction of Mr. John Bonner. Arklow Youth Choir, under the direction of Mrs. Geraldine Delaney. Arklow Revival Gospel Choir under the direction of Geraldine Hamilton. Arklow Folk Group, under the direction of Niamh O’ Neill. On the Organ was: Matt Sharpe. John Bonner. Rosarii Kinsella. The Community turned up in large numbers to witness the launch and it was a fitting tribute to our welcoming and friendly Church that was dedicated in August 1860. The world was a very different place then, and much has changed over the years, but our Church has served as a place of worship and a focal point for the people of Arklow since the eighteen sixties. 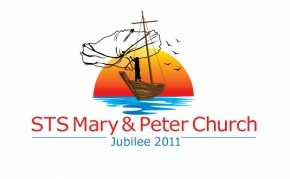 For a Parish that has such an interesting heritage and generations of Parish family traditions, it will give us all the opportunity to celebrate together this very special year in the history of our community.